It’s not my usual style, but I’ve acquired a couple of bootlegs toys that I thought they fit in rather well with my awesome collection. So here’s my showcase! Make no mistakes. 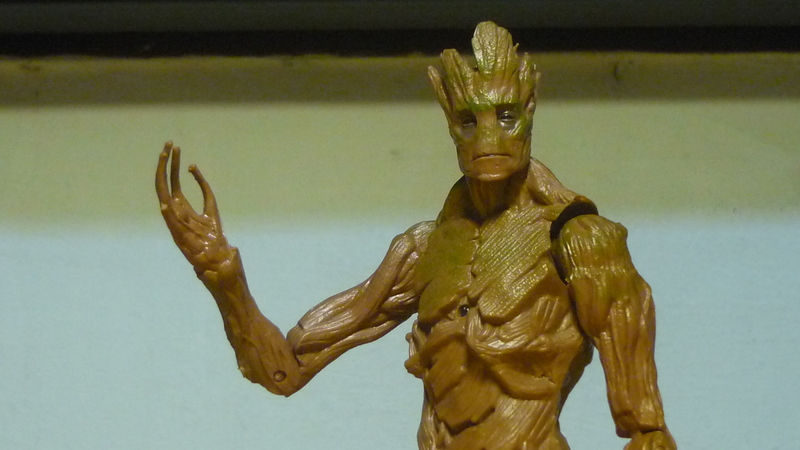 This Groot figure looks almost exactly like the Marvel Legends BAF Groot, but he’s definitely a bootleg. 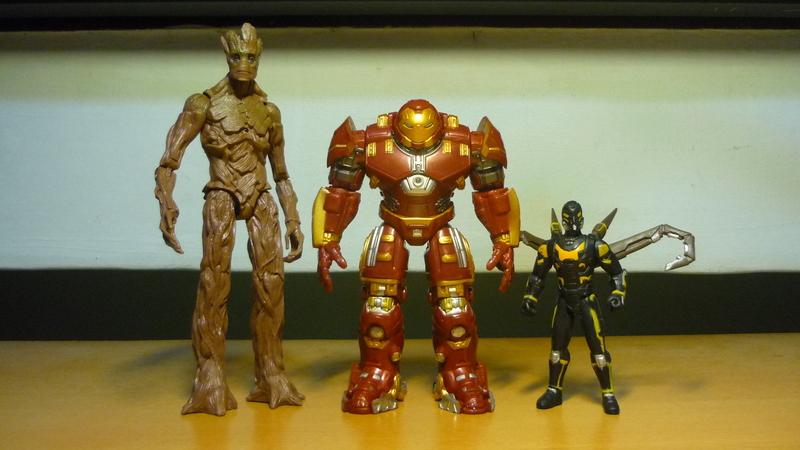 The BAF Groot has more articulation, especially for its ankles, wrists, shoulders, and upper torso. Bootleg Groot features a red LED in the middle of its chest, which lights up when a button on its back is pressed. 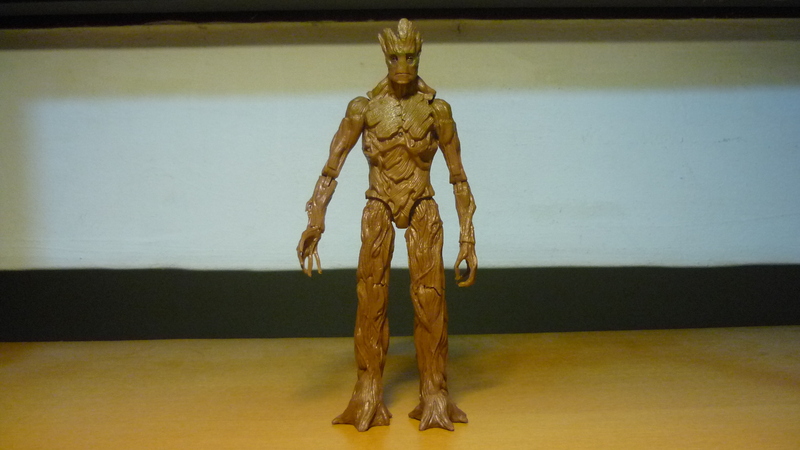 Apart from these difference, bootleg Groot looks more or less the same as BAF Groot, right down to the face and textures, which makes me think that the makers used the original BAF Groot as a mold to create the bootleg. 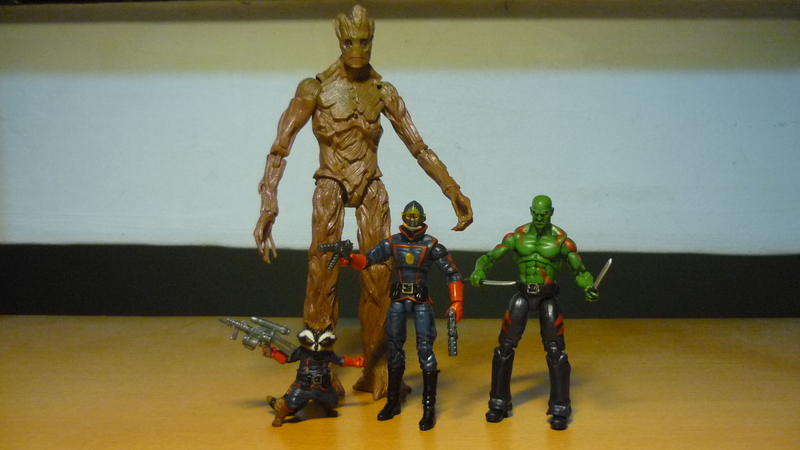 I wanted a Groot to team up with my other 3.75″ GOTG figures, but I do not collect the Marvel Legends series, and besides it would have been rather expensive to purchase all the BAF figures just for the Groot. The bootleg looks sufficiently similar enough anyway. 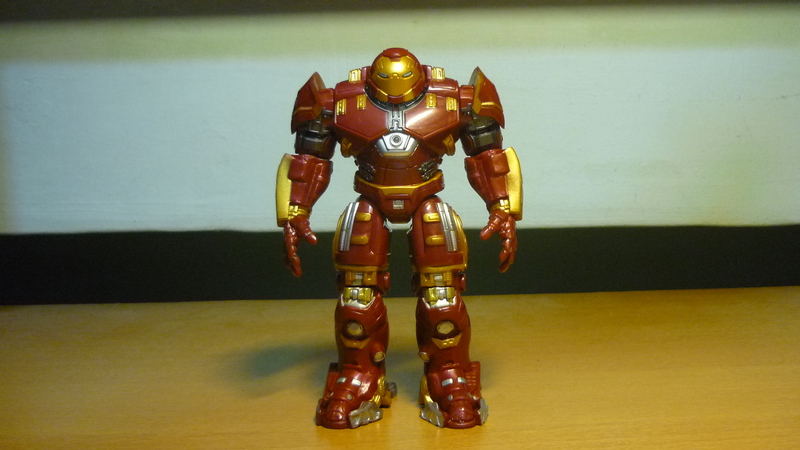 Based on what I have read on action figures forums, this bootleg Hulkbuster has got to be every Iron Man fans’ favourite 1/18 scale bootleg, as he is about at the same scale when compared with the other 3.75″ Marvel figures. See what I mean. 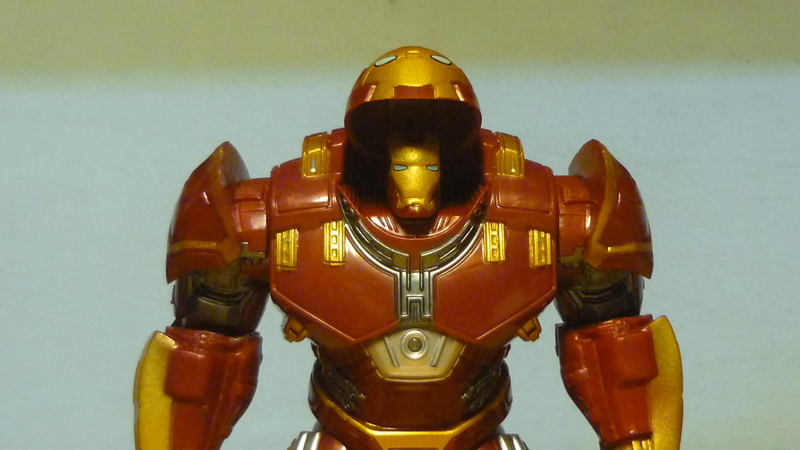 Hulkbuster’s helmet doesn’t match up with the movie appearance though. 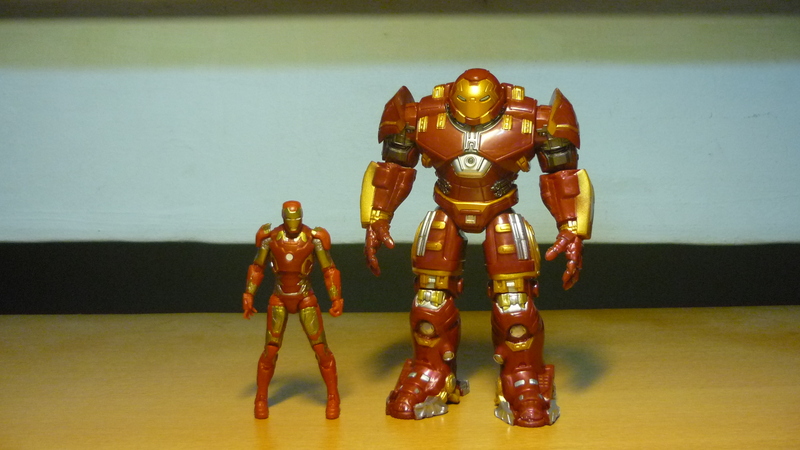 Word has it that bootleg Hulkbuster comes in two paint schemes, one with duller paint and the other with a more metallic paint. 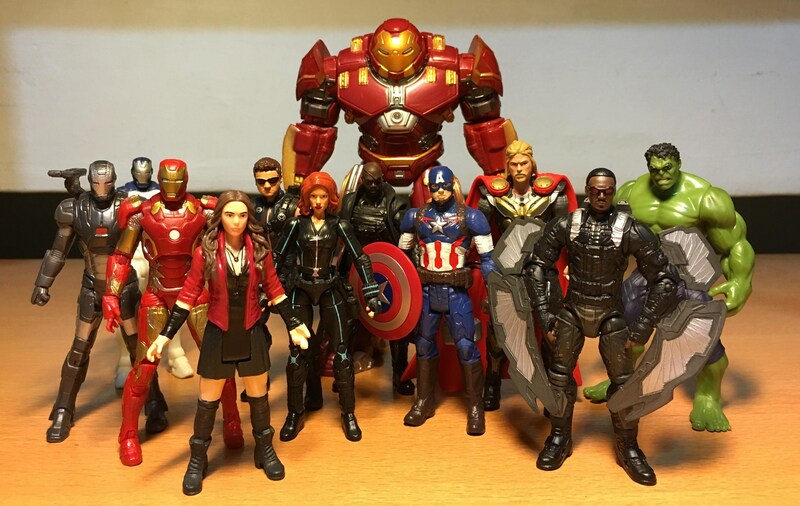 And it’s amazing that despite the makers’ blatant attempt at marketing an unlicensed figure complete with using the “Avengers” label, no cease and desist order was known to have been issued by Marvel over the bootleg. 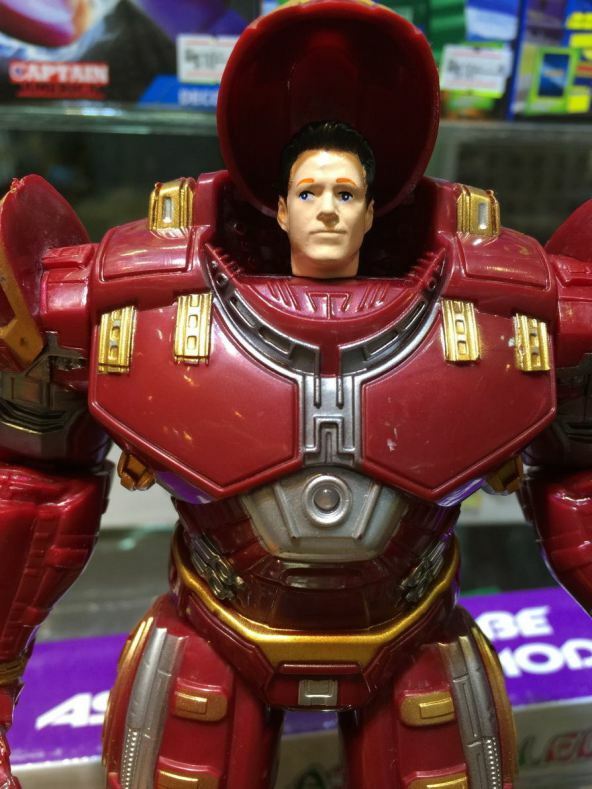 The helmet flips up to reveal either Iron Man, or some other guy who barely resembles Tony Stark. The blue LED lights up when a button at the back is pushed. 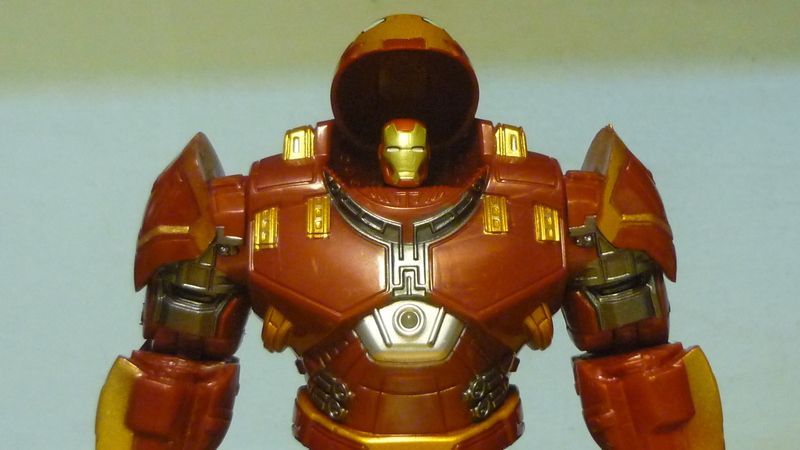 Or you can switch the head for a 3.75″ Iron Man head like what I did. 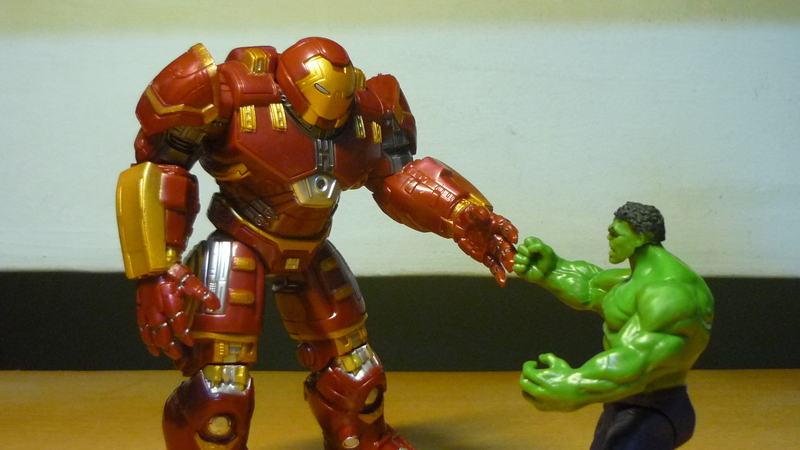 The 3.75″ AAOU Hulk does seem undersized compared with the Hulkbuster. 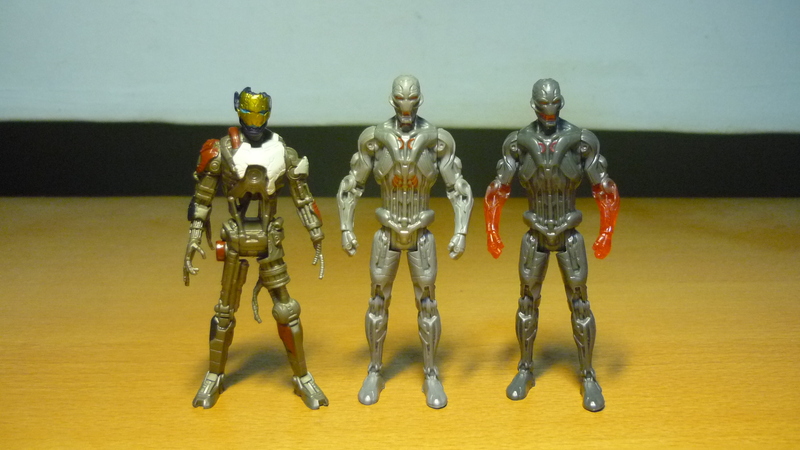 To round up the rest of AAOU figures, from left: Ultron v1.0, Ultron v2.0, and Ultron v2.0 with red hot glowing arms. Officially, the only 3.75″ figures released by Hasbro for the “Ant-Man” movie is just Ant-Man and his ant. 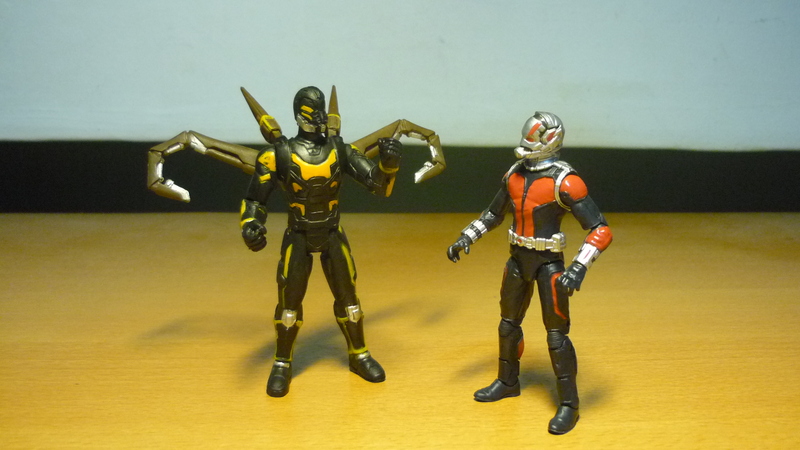 So, I acquired the bootleg Yellowjacket so that Ant-Man can have an adversary to fight with. He doesn’t look all that bad when compared with his movie appearance, although articulation is limited, with no knees, swivel elbows and shoulders. 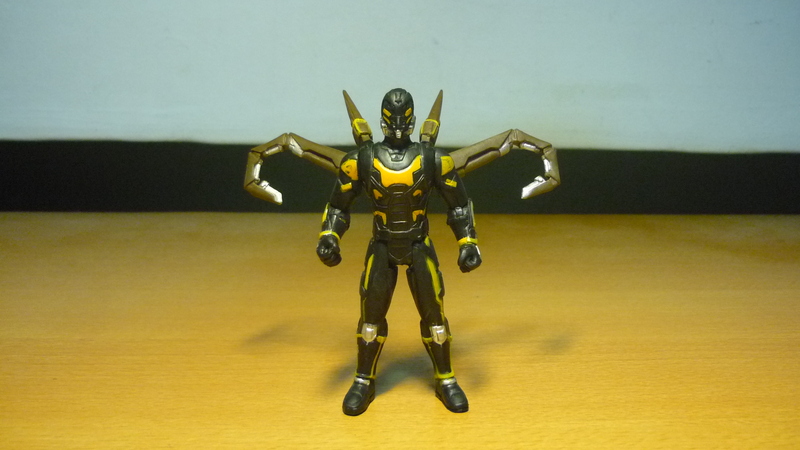 I’ll admit that I have half a mind to further customize a Yellowjacket figure using the bootleg’s head. But for now, I’ll leave him as he is. These guys are slugging it out on my table. Chances are that you’d be able to find them on sale on eBay, and nobody is quite sure who their makers are. 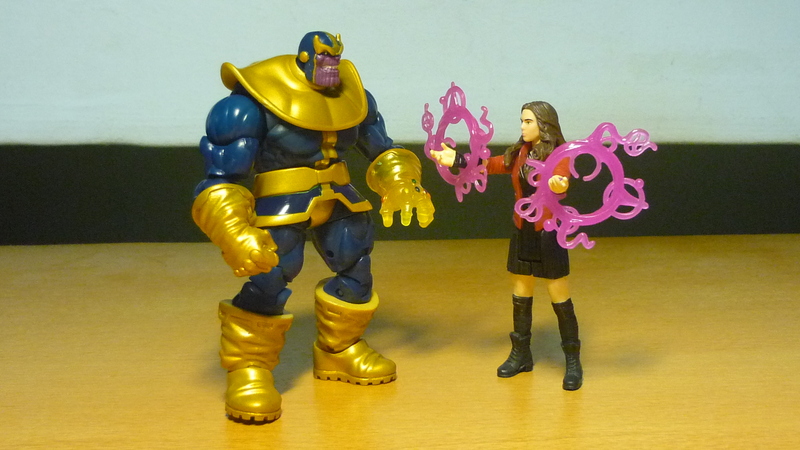 For some reason I’m looking forward to this scene, or maybe I should just watch the other movie. Heh.